Things have been crazy around here, mostly due to a huge project we undertook a few months ago--renovating a 400-year-old stone cottage in southern France (pictured right). It's become such a big part of our life that I can't keep it to myself any longer! Plus, I know if I don't document it here, it won't be documented at all; and I want to remember all the little details and nuances associated with renovating this old home. I thought it would be fun to start regularly featuring posts detailing the renovation process from step 1. I may throw in one post per week, or perhaps more. We'll see how this flows...If any of you have done this before, please share any tips! Also welcomed are style ideas for the interior...I have less than a month to make some crucial decisions regarding such. Thanks in advance! So here we go with Step #1: finding this cottage. The Husband and I are big fans of Rick Steves Guidebooks. He's been there for us on previous trips and during our last family vacation we consulted his expert wisdom yet again. 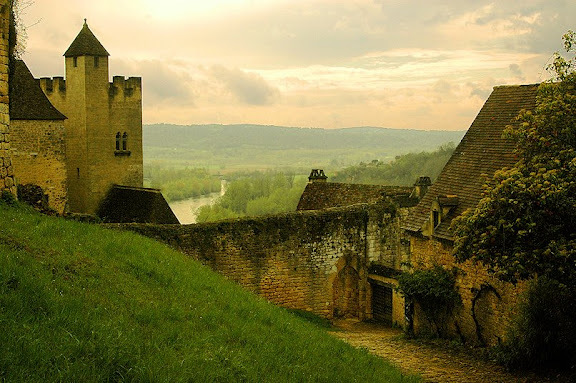 On the pages of Rick Steves: France, he mentions a lovely town in the Dordogne region called Beynac-et-Cazenac. The region itself sounded spectacular--if you love a good Medieval castle or two, great food, amazing scenery and an interesting history. We explored our options for lodging via VRBO and to our surprise, found a lovely home owned by a couple in Utah (where we lived at the time). We couldn't believe it! What are the odds? We ended up booking a week and at that point the wheels started turning. We thought, "if they live in Utah and manage a home in Beynac, perhaps we can do it too?" We always wanted to have a rental property as an investment, but overseas? Pourquoi pas? During our vacation we fell in love with the place. It seemed perfect! Initially out of pure curiosity the Husband contacted the local agent (this is where a French-speaking spouse comes in handy) and arranged to see all 3 of the homes up for sale in this town. It's a tiny town :) All were lovely, but only one was in our price range. What we did next, we found out later, is not nearly as common in France as it is in here in America and even a little taboo. We submitted an offer that was below asking price. Also included in our offer was the reasoning behind the price submitted. We wanted to explain in detail to the homeowner all of the renovations we hoped to make to the home and how we wanted to make it even more magical. I gave the offer a 5% chance of being accepted. Next up: the history behind this ~500-year-old stone cottage. I'm so glad you're sharing this with us! I look forward to following along. Okay, I'm speechless! I'm so glad you are sharing this excitement. I was just thinking of your trip to Paris with your sister yesterday and was inspired once again to make things happen. . . and now this -- so fantastic! You are amazing! OH my goodness. I LOVE that photo (you posted it before with that color palette website, right?) and I cannot believe you own that. And now I know where I'm staying when I finally get to go to France! :) I can't wait to see more details. Oh my gosh, this is so exciting! I'm so thrilled to read this -- my husband and I are considering doing something very similar. I will be reading these posts with great interest. Thank you so much for sharing! i'm glad people actually do that kind of thing..
wow. my first thought was - are you kidding me? :) just amazing. i can't wait to hear the stories and see your progress. also, will you be renting the home when you're not there? can't believe it. love it!!!! Jill, Emily: yes, we will be renting the home upon completion. The cottage will not be a "second home", but rather a vacation property. Hopefully every now and again we'll get there ourselves but in the meantime, we hope that many, many people will find themselves enjoying a vacation in the Dordogne...and staying here! p.s. Emily, yes that is the photo I included with the color palette post. How exciting! I noticed you went to Cinque Terre last year and I am going in a month! The only problem is that I still haven't booked a place to stay there. Any suggestions? Oh, my goodness. I already know that I would love to stay there. Going to France has long time been a dream, maybe I now know where we will stay. I am so happy for you and your family. wow. not only is that picture breathtaking, but the fact that you're really doing this is unbelievable! how very fun. something i imagined someone could do in their 50s or 60s, but at your age, how fabulous! How delightful. I look forward to reading about the whole adventure of being a foreign-country-property-owner. wow -- that view looks gorgeous. I am seriously jealous. Actually, we were talking about you and Ben and Cher and Jon and how much we admire how you all live your lives. And all the ways we could improve to be a little bit more like you! OH. WOW. I cannot believe you've had all this exciting venture going on and haven't shared it before, Steph! SO. COOL! Sharmyn and I have talked about how fun it would be to do something like this... once you got past the headache of it all, right? And I'm TOTALLY looking forward to more posts on this exciting project. Please keep them coming! Tish, We stayed in a place in Vernazza (where we rented the boat) that we found in rick steves Italy. It was pretty basic and not very expensive. I do remember that some if the rooms had views (not ours) and it was really a matter if luck. Book soon though as places fill up super fast in this little town. Have fun! Oh my goodness! That is the coolest thing ever. I had to look at the picture twice because I thought it was a painting. Lucky you! Please put my family down on the guest list when the renovations are done. Wow - so exciting! I can't wait to hear more and see more pictures. Wow. That looks like heaven. Looking forward to the posts about the renovations. Can't wait to see the inside! We've been wanting to plan a trip to France and Italy, so now that we'll have somewhere fabulous to (potentially) stay in France, well, it gives us more incentive! holy cow and i thought having a rental property 3 hours away was cool ;-) But, FRANCE!!?!?!?! Can't wait to hear more about it and more about how you plan to spend time over there with your sweet family. you are lying! what an amazing place! i look forward to following along your journey! How beautiful! It's like a dream! Looking forward to your updates! how amazing, a french cottage!! and your story is incredible. makes me dream we can someday have a sweet cottage someplace. can't wait to hear more. Wow! That sounds like such a dream-come-true! Congratulations! Can't wait to visit, it looks beyond gorgeous and I am pumped for your upcoming posts of the renovation. Special cheers for France!!! Anyway, in a nutshell, you are SO cool! I'm so excited to read all about this renovation. Post all you want on the subject! I am in awe. That is just too cool! I'm excited to read the updates. Oh my Gosh!!!!! How exciting! What a dream come true! I can't wait to see the finished project! I am beyond speechless. Wow! LOL! What a lovely, lovely, gorgeous, HISTORIC cottage! Congrats! I can't wait to see more, more, MORE! And to stay there too! Wow! What an exciting adventure and project for you and your husband. I look forward to watching the work as it unfolds. That is so amazing! I will await all details and updates on the edge of my seat! :) Congrats! HOW COOL IS THIS?!!! Congrats!! I am so excited that you are not only taking on this adventure, but also that you are sharing it your readers. Having lived outside the U.S for the past few years now (first in the Caribbean, and now in the UK), I often find myself on the receiving end of comments like “well, it’s good that you are doing this now because you could never do it once you settle down and have kids..”. Yet living abroad, or investing in a property abroad, isn’t as half as farfetched as people make it out to be. I believe that everyone should do it if given the opportunity, no matter what stage of life they are in. Thus, I am so glad that you ceased the opportunity, rather than rationalizing your way out it. It will surely be challenging at times- the US has a certain efficiency that you simply don’t find in most other countries, and I know firsthand how frustrating the cultural and legal differences can be. However, it will all be worth it in the end & I hope you family can get out there and enjoy the house as much as possible. I can’t wait to hear about the renovation process! Steph and the Husband: Well done! Hoorah for Beynac-et-Cazenac and Hoorah for you! I look forward to seeing more about your renovations and guarantee that this will be an inspiration to your idle moments (do you have any of those?). Thanks for sharing and therefore being an inspiration to us too! That picture looks like something out of a dream. Way to seize the opportunity! P.S. I've been a fan of your blog since I discovered it a few months ago, but I don't think I've commented before now. This post was enough to bring me out of lurker-ville. I'm so excited you'll be posting details about the renovation! How fantastic for you! Ben and I are going on a Mediterranean cruise in 6 days with a stop near Nice, France and I know one day there just won't be long enough....now I know where I can stay on my next trip! you really are my hero. Oh so lovely. I can't wait to see it again when it's done...And move forward with our plans to stay in Beynac together! I'm loving that your posting on it now, it's so exciting! I can't WAIT to read about your adventure with this!!! I am SO crazy excited for you guys. What an AMAZING, wonderful, embrace-life-for-everything kind of a thing to do!!!! Will you be renting out?? I remember this shot from a previous post and who knew this lovely was yours? What an adventure! I can't wait to keep up on the progression. AMAZING! I would love to visit your little french cottage. Wow. Sounds like a dream. I don't even know you (except through your blog) and I'm way excited for this venture you are taking on. Wow! That is so amazing, we are in the throes of a total gut rehab in our own neighborhood, an 1840's brownstone. My husband is the acting GC, in addition to his having another business to run. We can keep our eye on the project and even with all this, it is a major headache. I can't imagine doing a renovation in another country, on a 500 year old castle to boot, it is so brave and exciting. I always wanted to do something similar in Italy, but for now I will just have to dream, and read about your experiences. Thanks so much for sharing. oh my how incredibly cool! can't wait to hear more. Oh I am so jealous. My husband and I have talked about doing this! Please, please post all the details...especially those where you have to handle it from so far away. Good luck! Lovely, lovely place. I have just found your blog and read your story on renovating this home in France... it sounds so very excited. I can't wait to read more! Beautiful photo. This is soooo exciting! I can't wait to live vicariously through you! Does that mean we can rent it from you when you are ready??? Wow, I am just so excited! way to live your dreams! WOW! Sounds like it was meant to be! oh wow ... i would be black and blue from pinching myself if given the opportunity to have such an exquisite piece of architecture ... just imagine the history and now it is going to be part of your history! I am so excited for you! You are living my dream! I have reread A Year in Provence and Under the Tuscan Sun many times, just so I can dream a little. Congrats! Wow! I love this! After my husband and son and I lived in Paris for a year we decided we want to work toward buying property in Normandy, so I am glad to see that small young families can do it too! Can't wait to see how it progresses. Wow that's so cool, I want to take on a project like this sometime in my life. Good for you, your story is inspiring! So, who buys a charming cottage in France on a whim? Apparently you do! That is so stinking cool. Wow - what a dream come true! You re, I guess , perhaps curious to know how one can make real money . There is no need to invest much at first. You may start to receive yields with as small sum of money as 20-100 dollars. and I invite you to do the same. It`s all about how to choose a proper partner who uses your money in a right way - that`s it!. AimTrust represents an offshore structure with advanced asset management technologies in production and delivery of pipes for oil and gas. and I invite you to do the same. It`s all about how to choose a proper companion who uses your funds in a right way - that`s it!. You may probably be very curious to know how one can make real money on investments. There is no initial capital needed. Please visit blog and send me private message to get the info. P.S. I make 1000-2000 per daily now. and I'm ready to share my secrets at my blog. P.S. I earn 1000-2000 per daily now. We rehab houses In Maryland,US.